Because the Spitfire was one of the few British aircraft produced before, during and after World War II it is an excellent example of an airframe which evolved and changed to fulfil several combat roles. The need to keep pace with enemy fighter aircraft meant that there was a need for engines which could also evolve to provide more power more efficiently at all altitudes. The Spitfire’s partnership with the Rolls-Royce and the utilisation of their Merlin and Griffon engines was to result in the rapid development of increasingly more powerful engines with a range of superchargers and supercharger settings optimised for different altitude bands. There were 24 marks of Spitfire, but also, as will be seen, many sub-variants within the marks. The entire Spitfire family may be divided by the generation of Rolls-Royce engines which powered the aircraft. Thus the first generation was powered by single-stage Merlins, from Merlin II to Merlin 50 and resulted in Spitfires Mks. I, II and V as the most prominent fighter variants. Two-stage Merlins (meaning the use of two-stage supercharger for increased altitude performance), from Merlin 61 to Merlin 70, provided the basis of mid-war development, Mks. VIII, IX and XVI being the most prolific versions of this family. 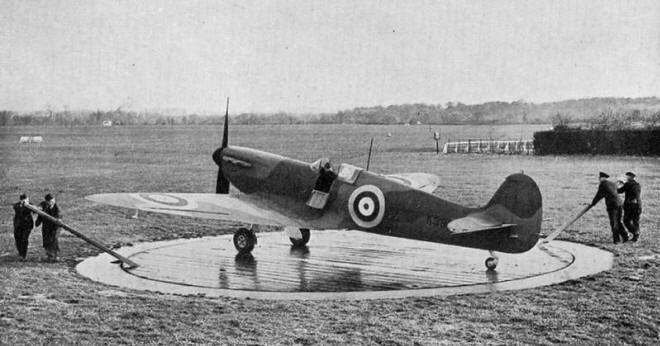 Finally, the arrival of Rolls-Royce Griffon provided a basis for the final line of Spitfire development, exemplified by Mks. XII, XIV and their post-war derivatives. This article describes the initial Spitfire line powered by single-stage supercharged Merlin engines. It is notable that throughout the entire development process, which took place over twelve years, from 1935 through to 1948, there were no outstanding failures of the basic design: this is a real testament to the original genius of Reginald J Mitchell, his successor Joseph Smith and the design teams they led. Official photograph of a Spitfire Mk. I from contemporary publication. Its shape was instantly recognizable already at the time of its service introduction, but the versatility and development potential of Mitchell’s airframe was yet to come to light. No discussion about the various Spitfire marks can be complete without referring to the different wing types, and indeed such references are made liberally throughout this article. The single-stage Melin Spitfires used four different wing types, A through to D which had the same dimensions and plan but different internal arrangements of armament and fuel tanks. Readers are advised to refer to my previous article Concise Guide To Spitfire Wing Types for an overview of the basic wing types of the Spitfire and the differences between them. Here is but a brief summary. The original wing design, the basic structure of which was unchanged until the C type in 1942. The armament to be carried was 8x .303 Browning machine guns with 300 rpg. This was the A-type modified to carry a 20mm Hispano cannon. The alloy covered ailerons were standardised during the production of this wing type. One type of armament could be fitted, comprising two 20 mm drum-fed Hispano Mk II cannon with magazines carrying 60 rounds/gun plus four .303 Browning machine guns with 350 rounds each. C type, also known as “universal wing”. This wing was structurally modified to reduce labour and manufacturing time plus allowing mixed armament options; A type, B type, or four 20 mm Hispano cannon. The Hispano Mk IIs fitted were now belt-fed from box magazines allowing for 120 rounds each (the “Chattellerault” system). The fairings over the Hispano barrels were shorter and there was usually a short rubber stub covering the outer cannon port. Also, the undercarriage mountings were redesigned and the undercarriage legs raked 2 inches forward, making the Spitfire more stable on the ground and reducing the likelihood of the aircraft tipping onto it’s nose. Unarmed long-range wing for reconnaissance versions with the D-shaped wing structure ahead of the main spar converted to integral fuel tanks capable of carrying 66 imp gallons. Starting with the Mk. 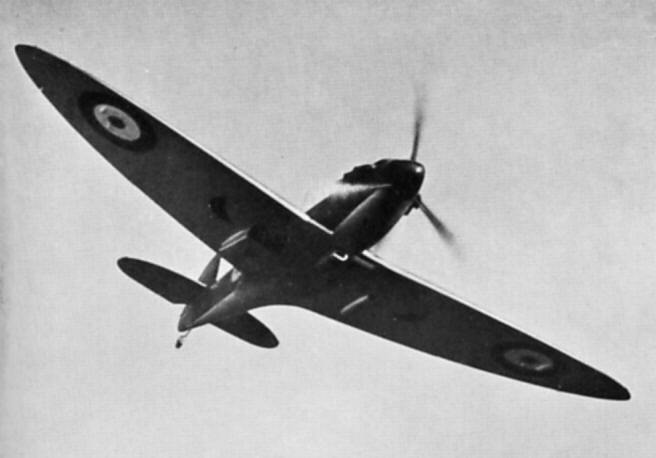 V some Spitfires had their rounded wingtips replaced by shorter, squared off fairings to improve low-altitude performance and enhance the roll rate. These are sometimes referred to as “L.F” versions, eg: L.F Mk Vb. This designation referred to the low-altitude version of the Rolls-Royce Merlin engine and while many “L.F” Spitfires had the “clipped” wings, a number did not. Also, readers should be advised that many Spitfires of one mark or variant may have been modified to another later in their career; for example, several of the first Mk Vbs were converted from Mk Ibs; the first Mk IXs were originally Mk Vcs, Mk. XVIs started their life as Mk. IXs and so on. All liquid capacities and measurements quoted herein are given in Imperial units. The Supermarine Woolston line started delivering the Spitfire Mk. I in late 1937 with front-line service commencing in August 1938. Over the next three years a large number of modifications were made, especially as a result of wartime experience. The earliest Mk. Is were powered by the 1,030 hp (768 kW) Rolls Royce Merlin II engine driving an Aero-Products 10 ft 8 in (3.3 m) diameter two-blade wooden fixed-pitch propeller, weighing 83 lb (38 kg). The Merlin I to III series all relied on external electric power to start the engine; a well known sight on RAF fighter airfields was the “Trolley Acc” (trolley accumulator ) which was a set of powerful batteries which could be wheeled up to aircraft. The lead from the accumulator trolley was plugged into a small recess on the starboard side cowling of the Spitfire. Early on in the Spitfire’s life it was found that at altitudes above about 15,000 ft (4572 m) any condensation could freeze in the guns causing unpredictable stoppages. The system of gun heating, was introduced on the 61st production Mk I. Following complaints from pilots which required more headroom, a new form of “blown” canopy was manufactured and started replacing the original “straight” version in early 1939. This canopy improved headroom and enabled better vision laterally and to the rear. A simplified design of pitot tube was introduced. The manual hand-pump for operating the undercarriage was replaced by a motorised hydraulic system. One of the earliest production Spitfires Mk. I displaying the characteristic initial features of this mark: two-blade propeller, unarmoured windscreen and fuel tank, “straight” cockpit hood and long “pole” antenna of the HF radio. All these elements, and more, were modified or replaced before the time of the Battle of Britain, leading to significant improvements in performance and combat-worthiness of the aircraft. At the outset of World War 2 the flash suspensors on the gun muzzles were removed and the practice of sealing the gun ports with fabric patches was instituted. The patches kept the gun barrels free of dirt and debris and allowed the hot air to heat the guns more efficiently. When the guns were fired the patches were shot through, and were always replaced by the ground-crew during rearming. At about the same time the original ring & bead sight was removed and replaced by Barr & Stroud reflection gunsight. The Aero Products wooden propeller was replaced by a 350 lb (183 kg) de Havilland 9 ft 8 in diameter, three-bladed, two-position, metal propeller, which greatly improved take-off performance, maximum speed and the service ceiling. It also started the incremental weight increases which continued through the life of the airframe. The “rod” aerial mast was replaced by a streamlined, tapered design. From the 175th production aircraft, the Merlin Mk III, which had a “universal” propeller shaft able to take a constant-speed de Havilland or Rotol propeller, was fitted. Just before the Battle of Britain a de Havilland constant speed propeller, of the same diameter as the two-position unit, became available. Although this was a great deal heavier than the earlier types (500 lb (227 kg)) it gave another substantial improvement in take-off distance and climb rate. A thick, laminated glass, bullet proof plate was fitted to the curved, one piece windscreen. A 3mm thick cover of light alloy, capable of deflecting light machine gun rounds, was fitted over the top of the upper fuel tank. From about mid-1940, 73 pounds (33 kg) of armoured steel plating was provided in the form of head and back protection on the seat bulkhead and covering the forward face of the glycol header tank. Rear view mirrors were added to the windscreen: two early “shrouded” designs were later replaced by a simplified, rectangular, adjustable type. “Two step” rudder pedals, which were fitted to all frontline Spitfires just before the Battle of Britain: these allowed the pilot to lift his feet and legs higher during combat, improving his blackout threshold and allowing him to pull tighter sustained turns. Starting in September 1940, an IFF (Identification friend or foe) transmitter was installed. This weighed about 40 lb (18 kg) and could be identified by wire aerials strung between the tailplane tips and rear fuselage. Although the added weight and the aerials reduced maximum speed by about 2 mph, it allowed the aircraft to be identified as “friendly” on radar. At about the same time new VHF T/R Type 1133 radios started replacing the HF TR9 sets. These had first been fitted to Spitfires of 54 and 66 Squadrons in May 1940, but ensuing production delays meant that the bulk of Spitfires and Hurricanes weren’t fitted for another five months. With the new sets, the pilots enjoyed a much clearer reception. The new installation meant that the wire running between the aerial mast and rudder could be removed, as could the triangular “prong” on the aerial mast. Modifications to the Spitfires Mk. I in service were introduced incrementally, resulting in a variety of interim configurations at the unit level during the period of 1939-1940. Here, two Spitfires of No. 611 Squadron photographed in Autumn 1939 sport de Havilland three-blade two-pitch propellers, armoured windscreens and fuel tanks as well as bulged canopies, but they are still retaining the early form of radio masts. Weight increases and aerodynamic changes led to later Spitfire Is having a lower maximum speed than the early production versions. This was more than offset by the improvements in take-off, climb rate and ceiling brought about by the two-position and constant speed propeller units. At the start of the war the engine ran on the then-standard 87 octane aviation fuel. From March 1940 increasing quantities of 100 octane fuel, imported from the U.S, became available. This meant that during the defensive battles over Dunkirk the Spitfire Is benefited from an allowable increase in supercharger “boost” from +6 lbs to +12 lbs without damaging the engine. With the +12 lb “emergency boost” the Merlin III was able to generate 1,305 hp (973 kW) in a five minute burst. If the pilot resorted to emergency boost, he had to report this on landing and it had to be noted in the engine log book. Combat experience showed that the fabric covered ailerons seemed to lock solid in high speed dives: this was caused by the fabric “ballooning” which, in turn, increased the control stick forces needed to move them. From November 1940 Supermarine started producing light-alloy covered ailerons as a which did not have this deficiency. Fighter Command ordered a crash programme to have all front line Mk Is and Mk IIs fitted. No. 19 Squadron received several Spitfires Mk. I armed with two Hispano 20mm cannon during the Battle of Britain. These were known as the Mk. Ib, the eight machine gun Mk Is were retrospectively called the Mk.Ia. This early cannon installation was hampered by frequent jamming problems. In one engagement, only two of the 12 aircraft had been able to fire off all of their shells. Further cannon-armed Spitfires, with improvements to the cannon mounts were later issued to 92 Squadron and it was eventually realised that the best armament mix was an aircraft with two cannon and four machine guns. Most of these trial aircraft were later converted to the first of the Mk Vbs. In all, 1,567 Mk Is were built (1,517 by Supermarine between May 1938 and March 1941, 50 by Westland, July to September 1941). To my knowledge, the early variants of the Merlin 45 used a standard float type carburettor (SU), which soon got improved through the crude but effective Tilly orifice, and only later (late 1942?) got decent float type carburettors that had little/irrelevant difficulties with negative g’s and never received injection type carburettors, that had no difficulties with negative g’s. Since this has been a point of major interest for me lately, could you please give more detail on that? The fascinating thing about the Spitfire was it’s revolutionary construction, as a mass produced aircraft. Monocoque stressed skin construction was a rare concept in the late 30’s, compared to the conventional construction of a strong internal frame, with essentially a non load bearing outer cover. I wonder if Mitchell having worked on sea plane hulls at Supermarine, which would have also basically been the same, and seeing the strength of those flying boat hulls, had decided to adopt this type of structure for his fighter? The wing leading edge skins, seperate top and bottom, which when attached to the wing spars, formed the very strong leading edge “D” box, are amazing. They are one full span piece of sheet metal and look to me, to be amazingly complex in curve and shape. I would love to see how those were formed, and indeed, are formed today for re-builds? @James: interesting point, but as a non-engineer I wonder just how novel the monocoque construction really was. How about the American high-speed airliners of the 1930s, or the Messerschmitt in Germany? Boeing 247 first flew in 1933, Bf 108 appeared in Challenge 1934, both types being good examples of commercial applications. Mitchell’s own S.5 built for the 1927 Scheider Trophy had semi-monocoque fuselage, too. Martin you’re quite right, had forgotten the Boeing, not to mention the DC2 and legendary DC3. I was thinking more in Mitchells back yard, in terms of RAF aircraft and RAF maintainance personnel. He may have been worried about his fighter getting chosen, when maintainance and mass production would be considered I wonder? Again you are also right about the S6. Also, an interesting point about the 109 prototype, which I think had flown quite some time before K5054? @James: Just what I meant. It would appear to me that all-metal monocoque construction was employed rather broadly at various places since the beginning of the 1930s, with some companies embracing the technology (Supermarine, Douglas starting with DC-2, Lockheed starting with Electra, Boeing 247, Messerschmitt starting with Bf 108). In contrast, some other successful companies of the time took a stance of waiting and seeing (Hawker, Junkers). Regarding metal construction in general, I believe that the French Wibault acted as a leading star of all-metal aircraft production in the 1920s, together with – of course – Junkers of Germany. Both companies built their technology on corrugated sheet metal and so their own aircraft designs did not employ monocoque construction. However, Polish PZL which had acquired Wibault technology by license, was turning out all-metal monocoque fighters since the beginning of the 1930s. At the same time, there can be no doubt that the technology had been new – so even though metal construction was presumably manageable at the drawing office level, there were problems of large-scale production. One of the reasons contributing to the well-publicised delays in the initial Spitfire production was just the lack of experienced metal workers in the Southampton area. Although not quite as publicised, there must have been similar problems among the RAF ground crew. I’m sure that Mitchell was well aware of these problems, but made a knowing choice of maximising the performance of the new fighter at the expense of other parameters like cost or manufacturing simplicity. Luckily, his approach eventually proved to be right. As a comment to your last point, obviously the Bf 109 first flew before the Spitfire, and we know that Mitchell had access to RAF intelligence sources so that he was informed about its existence. I remains unclear, however, how much detailed information about the Bf 109 was available in Britain at the time, and in any case, by the time the Supermarine was well advanced with their own design. Spitfire PR IV serial x4492 seems to have a non-standard camouflage pattern below the cockpit. Do there exist more images of it to confirm this? See our Site Index, recent Entries (RSS) and Comments (RSS).